This is an excellent way of cooking fish with vegetables. It is simple, tasty, and healthy. You can use any fish and/or vegetables that you fancy. Serve with rice for a complete meal. Combine the soy sauce, the Sriracha sauce, the honey, the sesame oil, the ginger, the garlic, and the sea salt in a mixing bowl. Whisk well. 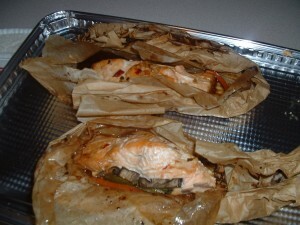 Cut a piece of parchment paper large enough to hold the salmon and the vegetables. Fold the parchment paper in half. Layer the vegetables right on top of the fold. Brush the vegetables with half of the soy sauce mixture. Place the fish on top of the vegetables. Brush the remaining soy sauce mixture on top of the salmon. Now you are ready to fold the package up. You do not have to be fancy. All that you are trying to accomplish here is to create a good seal so that the fish and the vegetables steam together in their own juices. Fold the ends of the parchment paper over the fish and the vegetables. I just start at one end and tightly seal the edges with narrow folds. When I get to the end, I just twist the top portion to seal. When you are ready to cook, place the package on a cookie sheet. Bake in a preheated oven set at 350 degrees for 35 minutes.